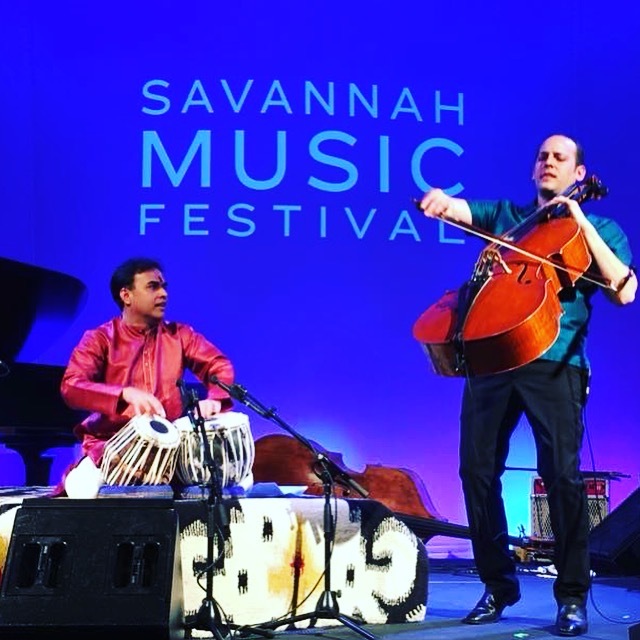 Sandeep Das (tabla) & Mike Block (cello/vocals) are a dynamic, cross-genre duo that originally met as members of Yo-Yo Ma’s Grammy Award-winning Silkroad Ensemble. Featuring a combination of the Tabla: a pair of Indian drums used in Hindustani Classical Music, Cello: a bowed string instrument used in European Classical Music, as well as Vocals: both rhythmic and melodic, this energetic duo has been performing since 2013, sharing their music throughout America and India via tours and residencies, and even on the stage of Carnegie Hall. Their debut album includes compositions from Western Classical and North Indian Hindustani traditions, adaptations of music from around the world, and several of their own original compositions. Sandeep Das is one of the leading Tabla virtuosos in the world today. Having established himself as India’s top Tabla maestro, he is one of the few Indian classical musicians to actively explore new contexts for his instrument beyond the music of his home country. Since his debut concert with Ravi Shankar at the age of 17, Mr. Das has gone on to perform with iconic artists such as Yo-Yo Ma and Paquito D’River at prestigious venues ranging from Carnegie Hall to the Royal Albert Hall. Performances for significant events such as the opening ceremony of the Special Olympics and the World Economic Forum, in addition to audiences such as the United Nations and the Queen of England, have established as a highly sought-after performer all over the globe. Mr. Das is also a prolific composer, and his compositions have been showcased all over the world–- his most recent piece, Vaishnavi, is currently on display alongside a statue of the Goddess Parvati at the Freer|Sackler in Washington D.C. As an educator, he is the founder of Das Tabla School and is frequently requested as an artist in residence at institutions ranging from K-12 schools to top universities such as Harvard and the Julliard School of Music. "Slow Day At the Cafe / Sweet Tea in the Porch / Juliannne Johnson"
"Raghupati Raga Raja Ram / Where The Soul Never Dies"